This morning the big blue recycling truck lumbered down our street, stopping at each house to collect the items placed at the curb for recycling. As a result, my post today involves recycling, but not that kind of recycling. Recently I read a suggestion that struck my fancy. The writer was encouraging photographers to search out and recycle old photos, just to see how creative they could be with some of the old stuff we all have accumulated, but maybe never used…sort of like digging through that junk drawer in your kitchen and discovering treasures you had forgotten. “Good idea,” I thought. So this evening I searched through the backlog of photos on my hard drive, looking specifically for pictures of animals that put a smile on my face. 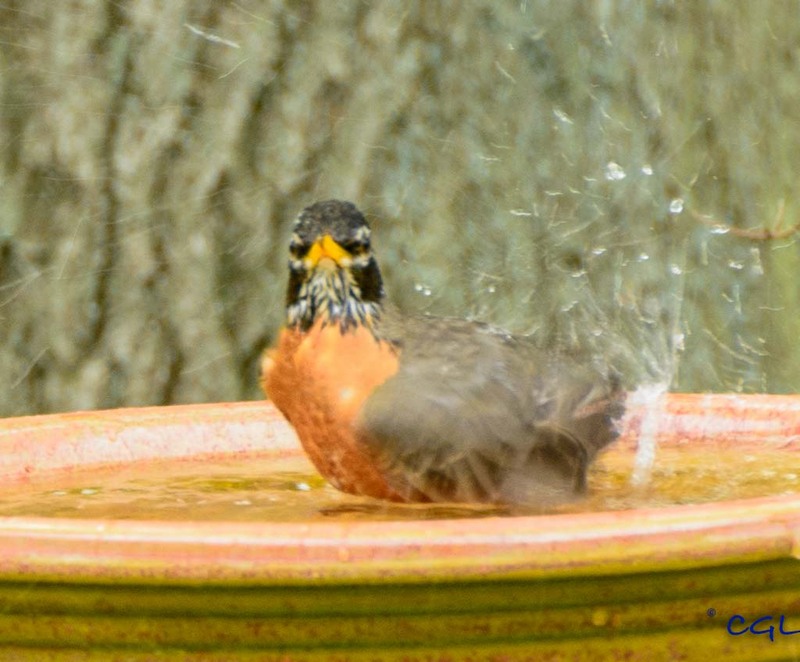 And here you have the first one, a chubby, self-satisfied American robin enjoying her day at the spa. And here is a song you may remember, although probably not, unless you are old enough to remember when Harry Truman was president of the United States (and yes, I am that old). I hope you like the song because if you are anything like me, it could be rolling around in your head for hours. Did it bring a few good memories to mind? Or maybe it will send you searching through your photographic junk drawer to see what you can come up with. If my “poor little robin, walking to Missouri” sends you searching, I hope you have fun. I did, and I’m planning to recycle another “funny animal”…maybe tomorrow.